What could be more challenging than finding a small white mammal in woodlands covered with snow? That is the essence of snowshoe hare hunting. To make it even more difficult, snowshoe hare are lightning fast and only feed at night. During the day, the little rabbits snuggle down in the snow to sleep, making them nearly invisible to the naked eye. Yet the attraction of snowshoe hare hunting lies in the challenge of locating these elusive mammals. To be successful takes patience and a solid plan of attack. One of the keys to finding snowshoe hares is to concentrate on their habitat, which often includes areas with a heavy conifer presence. They like to take cover beneath conifers or other brush. They regularly feed on conifer needles, but not exclusively. They also feed on the small branches of birch, aspen, maple, willow, blueberry and sumac, so a mix of these trees and shrubs will signal a good location to find snowshoe hares. Some of the best locations to concentrate on are areas near bogs, swamps or streams. If the sun is shining, focus on sunny areas, because the hares will be drawn to the added warmth the sun provides. One of the benefits of looking for game in the snow is that it is relatively easy to find signs of activity. Snowshoe hares often follow the same paths and leave a well-worn trail in the snow, which can alert you to their presence. If you find signs of fresh activity, you can bet a snowshoe hare is somewhere near. Following the tracks may lead you right to a resting hare. Using a good rabbit dog, such as a beagle, is effective in finding snowshoe hares, but it is not the only method. Teaming up with a group of hunters to walk in a line through the snow is also a proven strategy. Spread out, walk slowly and pause frequently. When snowshoe hares sense danger, they will often bolt during a pause in your movement. During each pause, have your gun ready, because there is often only a split second to aim and fire at a blur, as a hare blasts from its hiding place. Some hunters use a .22 when pursuing snowshoe hare, but the best bet is a shotgun, preferably a 20-guage. Snowshoe hare are amazingly quick and a shot gun provides added coverage that improves your odds for success. Of course, it is important to dress warmly when snowshoe hare hunting, but the key in dressing for a snowshoe hare hunt is choosing quiet clothing. 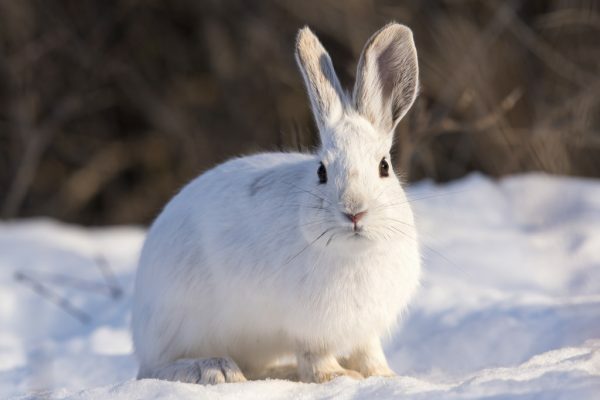 Snowshoe hares have exceptional hearing and if you are wearing a coat or pants that scratch, squeak or otherwise make noise when you are walking, you will definitely alert the hares to your presence. Among the best choices is wool, because it is extremely warm and does not generate any sound when you are moving.